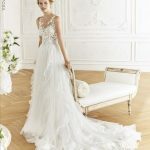 Bosforo is an exquisite princess wedding dress in tulle and lace. This romantic gown has a very sweet design that draws a suggestive and extremely feminine silhouette. The princess skirt is in tulle with lace appliqués, they trickle on to the skirt flowing on from the tulle and lace bodice. The sheer neckline is in crystal tulle and lace, this creates a marvellous illusion effect.